Surprisingly we know very little about the history of the motte and earthworks at Kilfinnane. I say surprising because this is a huge monument. The site is comprised of a trivallate (Three banked) ring fort and a Norman motte . 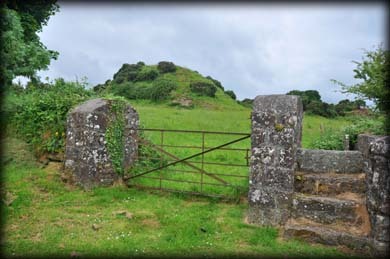 The three banks suggests it was probably a high status fort and many believe it might have been the Royal Seat of the King's of Munster in the Early Christian period (400 to 1000 AD). 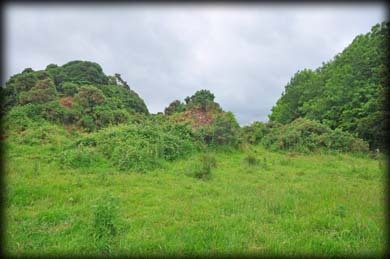 The 10 metre high Norman motte was constructed inside the ringfort in the late 12th or early 13th century. Because it was built inside the ringfort there was no Bailey. Situated: From Kilmallock head southeast on the R512 for 3.7 kilometres then turn right onto the R517. After 5.6K turn right staying on the R517/High St. After 130 metres stop at the sports ground on your right. Go over the stile. Discovery Map 73: R 6814 2296. Last visit June 2015.